Summary: "The land of Terre d'Ange is a place of unsurpassing beauty and grace. It is said that angels found the land and saw it was good...and the ensuing race that rose from the seed of angels and men live by one simple rule: Love as thou wilt. Set in a world of cunning poets, deadly courtiers, heroic traitors, and a truly Machiavellian villainess, this is a novel of grandeur, luxuriance, sacrifice, betrayal, and deeply laid conspiracies. 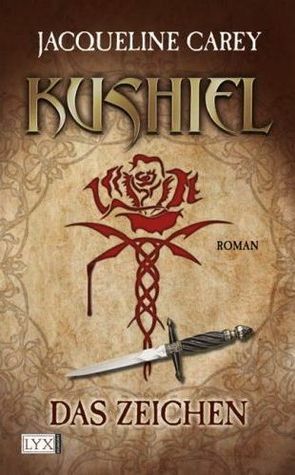 Not since Dune has there been an epic on the scale of Kushiel's Dart-a massive tale about the violent death of an old age, and the birth of a new." Review: This fantasy novel was recommended by a friend, and I have to admit, when I said I'd read this book I had no idea how long it was. It falls in the vein of traditional fantasy, with long passages and wordy descriptions, and a lot of travelogues featuring unlikely companions. Over 900 pages worth of it. It's a long, long book, and it felt long. But this book undoubtedly has its strengths as well: the worldbuilding and the intricate plotting were really well done, and the elements of mystery kept me going through the more wordy chapters. In fact, for a book this long, I was amazed at how everything felt crucial to the plot. It's one of those stories where there are blood feuds, ambitious schemers, and high stakes gamblers, all rolled together in a quest to come out on top. There are a lot of different characters with a lot of different agendas, and Phedre has to juggle them all. There are so many different things going on that I think there were at least four major villains in the story (plus your fair share of ambiguous characters) some working together and some not. It was certainly an ambitious story, and I applaud the complexity. It may have been too convoluted, though. I struggled to remember the names of all the many characters, and how they related to everyone else in this story. There is a cast list at the beginning of the book, but it wasn't detailed enough to help me piece tidbits together when I had trouble remembering everything. On the one hand, I could understand why it wasn't detailed: to give too much information would be to reveal some spoilers in the story. But it was frustrating for me to have a character appear who I had met before but couldn't remember since 400 pages and 75 other characters had come through since our initial meeting. This happened multiple times. It was discouraging. I have to be honest, I'd never read a courtesan-spy novel before. I was a little nervous going in, since the whole pain-is-pleasure thing is not my jelly. Happily, the courtesan scenes were not too graphic, nor were they very extended. Much of those scenes were partially written, with a fade-to-black sentence cutting off the scene. In fact, most of what we are shown are the moments when Phedre uses her cunning to glean information from her clients. I still could have gone without most of those scenes, for my personal taste. This book is a fantasy, but there are no creatures other than humans in the story. No elves, dwarfs, orcs, or the like in this book. Magic is limited to a small handful of characters who act as seers or fortune tellers, and one other mystical force that controls the water called the Master of the Straights. In fact, there was so little magic that the Master of the Straights felt out of place. I never could get behind that plot line. But the seers were dope. I loved the tidbits that they would offer, and loved seeing how their words and cautions were (mis)understood and (mis)applied. I've mentioned that this book is long. I appreciated and admired the giant scale of the novel, and since I enjoy political intrigue, I was interested in the story. It did feel too long, though. I felt like there were whole (100+ page) sections that could have been entirely cut. And I didn't like that it was told as if it had happened a long time ago for the protagonist, as I felt that took away from the tension and suspense in certain moments. However, I was impressed with the author's way of tying all the threads together in the end. I truly did not see how that could be accomplished, even with only fifty pages to go in the end, yet she impressively pulled it off. I'd recommend this to traditional fantasy lovers who prefer a lot of slow but satisfying political intrigue and spy stuff. I would not recommend this to anyone under 18, though, as some scenes were strong. Bottom Line: This is a strong installment in the cannon, and adult fantasy lovers will likely enjoy much about this novel. The political intrigue was particularly complex and enticing. Some readers may be put off by some strong material, however. This one sounds intent and worth the read if one could really focus. I absolutely love your GIF review.